Encourage leadership by example for Municipal Governments by preventing water waste at the most senior level. W3S Controller Module - Powered by Samsung Artik 10 and V-Tracker. The problem: getting citizens to follow strict water rules means municipalities need to follow the rules too. First tests . . . 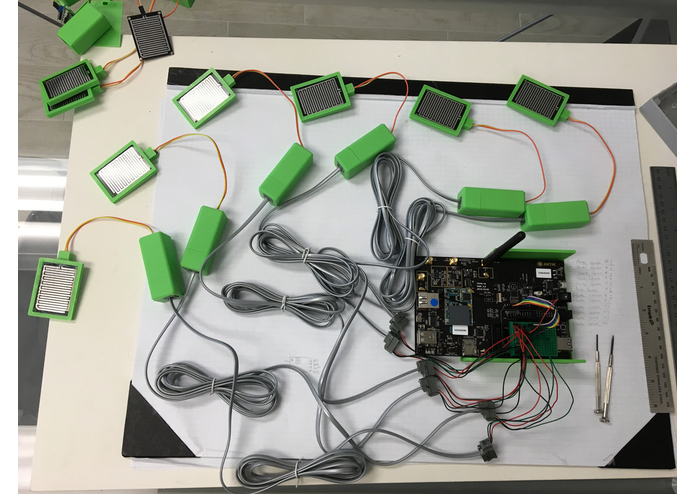 Early tests with all six sensors and initial module case prototype. 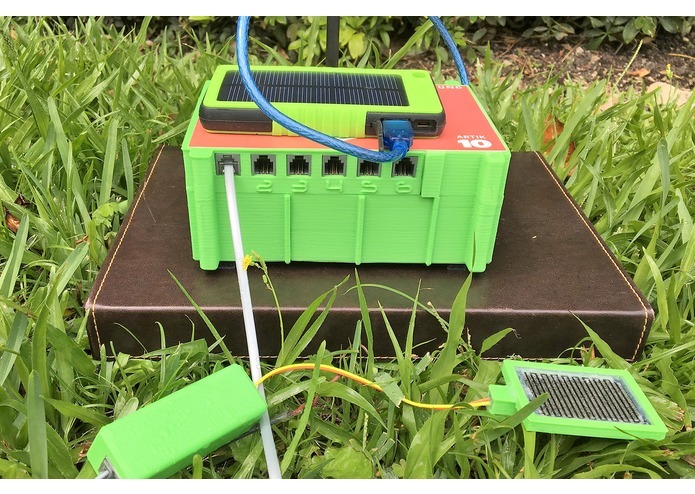 Deploy in field with solar power. W3S can have unlimited Customers, which in this case are Cities and Towns in California. Each Customer can have an unlimited amount of facilities being monitored. As many modules as required can be set up for each facility. The GUID is generated by the system on New Module save. Each module has defined sensors, so each individual sensor can be of a different type with a different action flow, as required. As many Action Flow definitions can be created as needed. 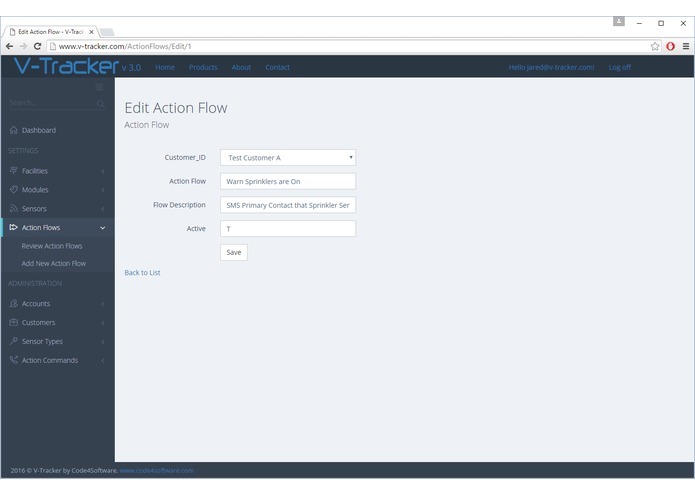 Each Action Flow will trigger Action Commands, which operate on the incoming sensor data, called a Threshold Value. 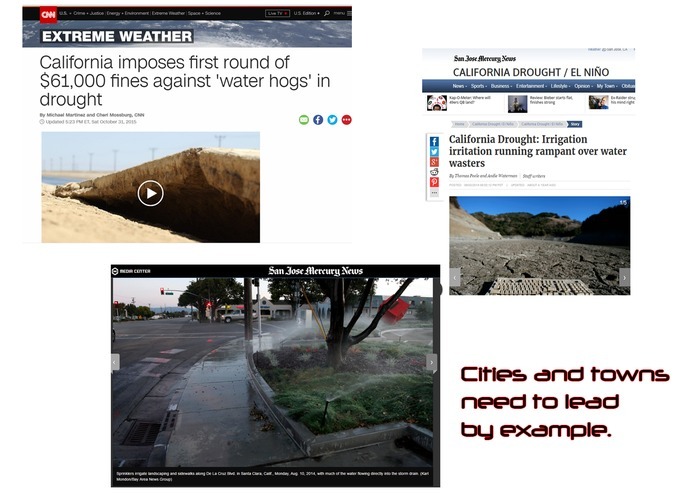 The drought coverage coming out of California included several news articles about angry people who were given hefty fines for wasting water, while at the same time the Municipal Governments in the areas where these individuals resided, were running their sprinkler systems. Often, no one in local government would claim responsibility and correct the problem until it became an irritating news item. It is human nature that people do not enjoy being told to do something by organizations that do not follow their own rules. This causes a loss of confidence in leadership and a lack of willingness to sacrifice with the seemingly valid argument, "[i]f they can run their water, I can run mine too!" Municipal leaders certainly do not want this reaction, but due to bureaucracy, these same leaders are often the last to know when such situations arise. If only City and Town Managers could receive a telephone call within a few minutes of the sprinklers being turned on or notification of other water waste, then they could save face, save water, and encourage public compliance with stringent water usage rules. 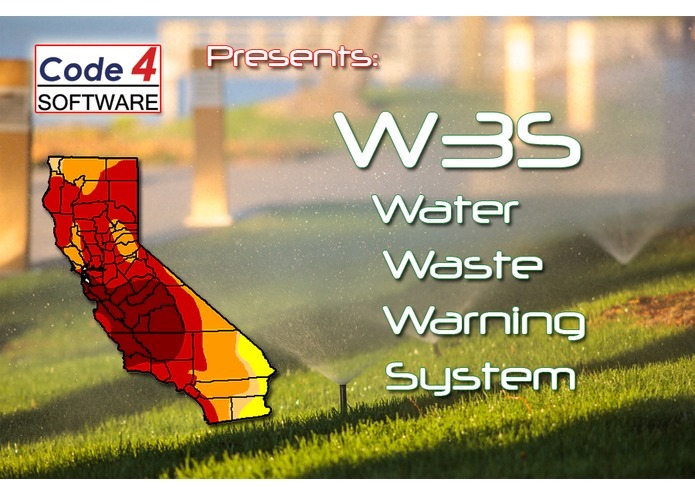 Knowing that most California municipal budgets are already stretched to the limit, the Water Waste Warning System (“W3S”) would have to be an inexpensive and easy-to-use solution that addresses this problem without impacting already sparse budgets and overtaxed personnel. 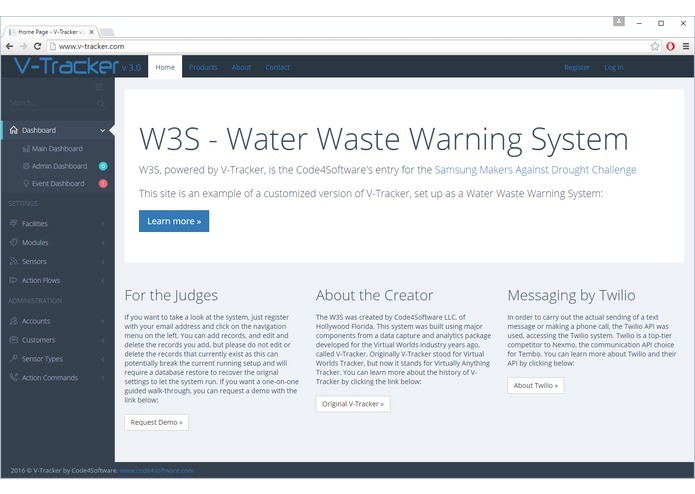 The W3S provides an inexpensive solution to monitoring water usage and alerting City Managers by sending them a text message or telephoning them with an automated system, when one of the W3S modules detects water spray. 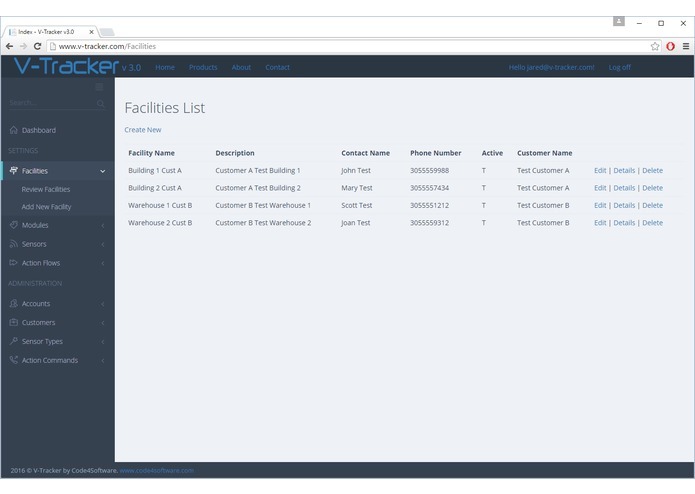 Each municipality is considered a separate customer in the database and each municipality can have multiple W3S modules in use across multiple locations. 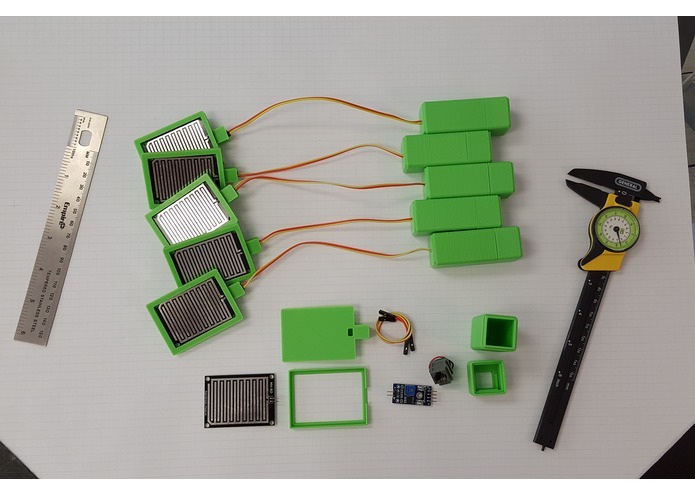 Each module can have up to six spray sensors that are connected via plain old telephone cable up to 200 feet away from the module. 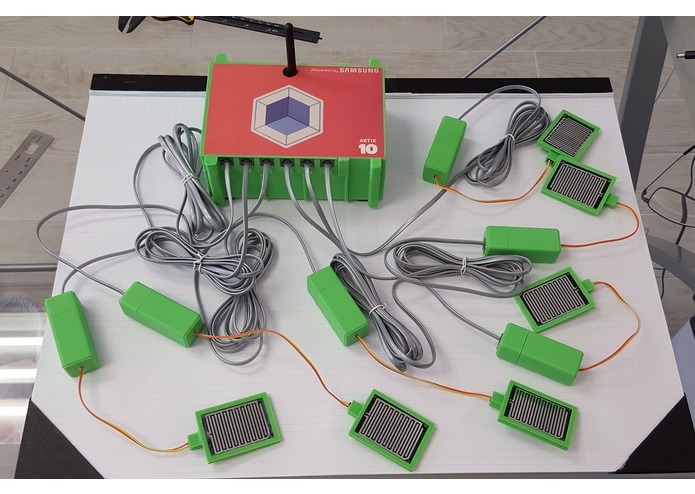 With a module centrally located from maximum length cable connected sensors, a single module can provide effective sample-site coverage of many tens of thousands of square feet. This is larger than most municipal properties, requiring that only a single module be deployed per municipal property. 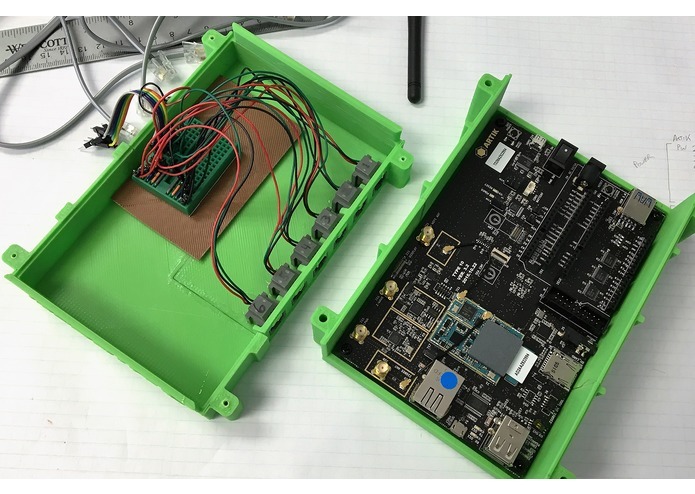 The module is built around the Artik 10 platform and uses WiFi to communicate sensor data via the municipal Wifi to the W3S server, via Web Services. 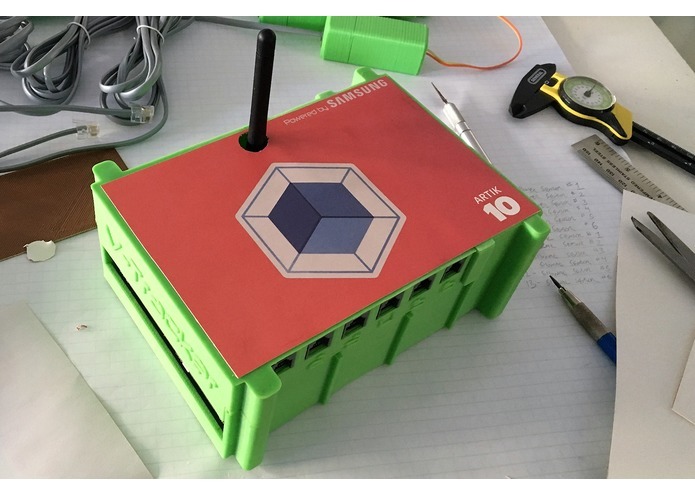 If there is no WiFi available, regular CAT-5 Ethernet cable can be used, as the W3S module software is smart enough to check for and use any available Internet connection. 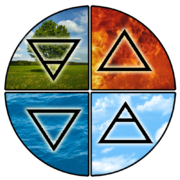 Each module requires a power source (battery, renewable or plug) compliant with the Artik board. A Web based dashboard allows the creation of new customers, modules, and assigns sensors to Action Flows, the W3S method of triggering activities like telephone calls and text messages. 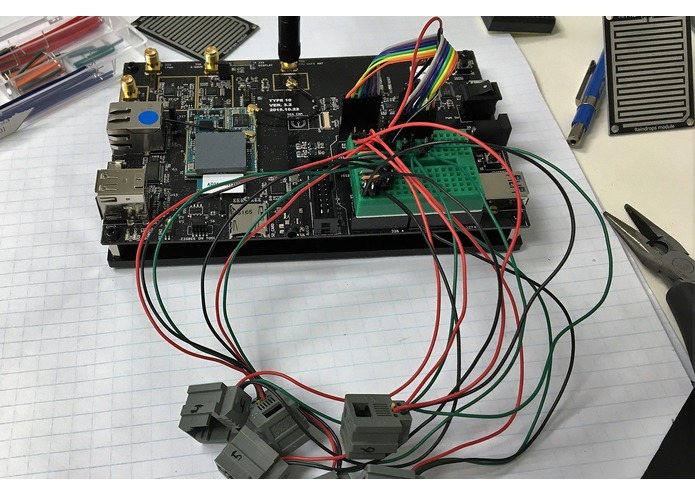 Using the Artik 10 board from Samsung, the initial configuration was completed using the documentation available on the Artik developer portal, then initial tests were conducted with a single analog liquid spray detection sensor. 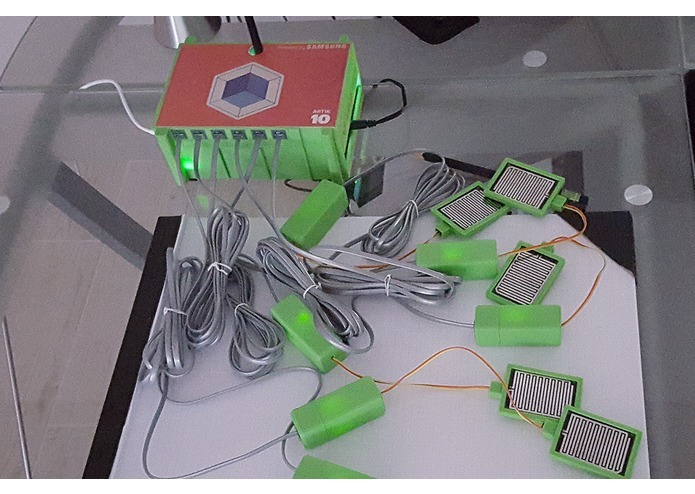 After success in monitoring the spray sensor, connecting to the Internet via the Arduino libraries was accomplished. 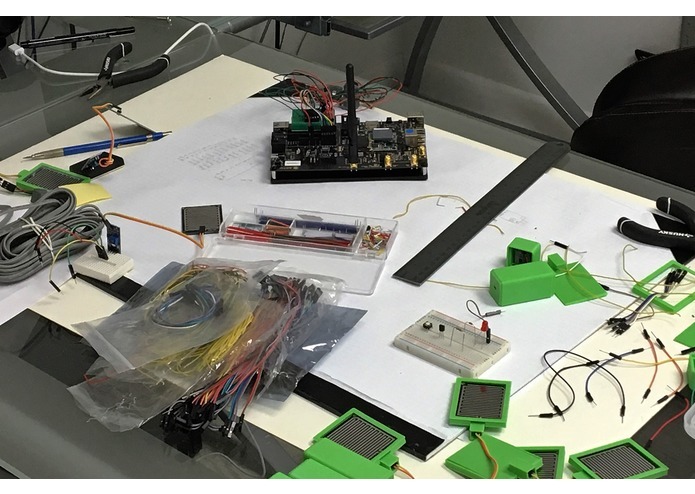 Getting the sensor data transmitted over the Internet led to then extending the sensor detector pattern for six analog sensors, the maximum allowed by the current Artik 10 development board. 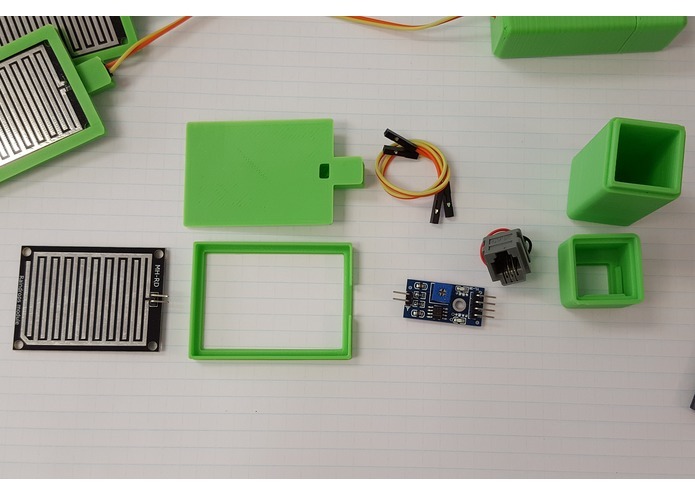 After the circuit and Arduino code was working and tested, cases for the sensors were created and a housing for the Artik board as well, using Autodesk Inventor 2015 and a Lulzbot 3D Printer. 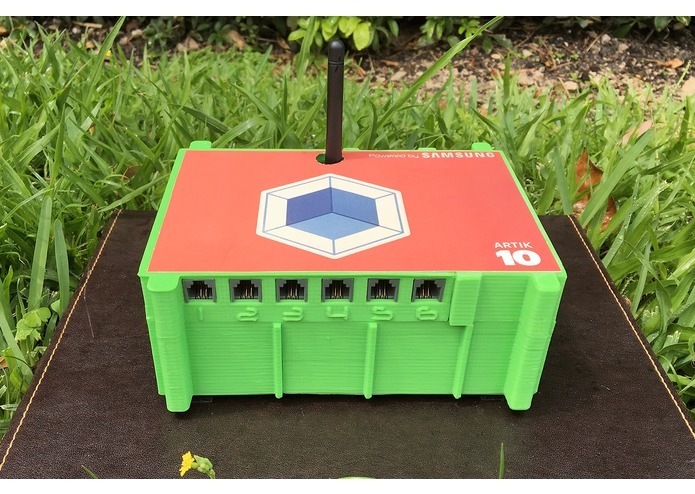 The cases and housing incorporate off-the-shelf telephone jacks (RJ-11) for ease of connecting sensors to the module, via ordinary telephone cable. Once the unit was assembled and tested, the server side of the project was completed, repurposing the major components from a data capture and analytics package developed for the Virtual Worlds industry years ago, called V-Tracker. 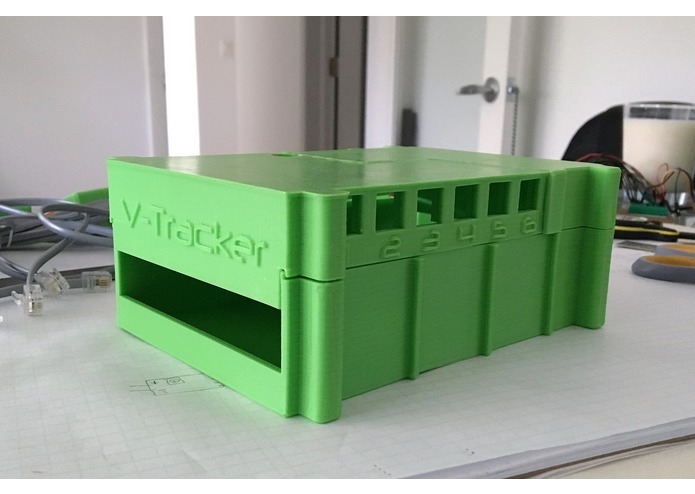 Originally V-Tracker stood for Virtual Worlds Tracker, but now it stands for Virtually Anything Tracker. In order to carry out the actual remittance of a text message or making a telephone call, the Twilio API was used, accessing the Twilio system. Being a new platform, there were not very many resources available to assist when things did not go as planned. While using Tembo would have been an easier choice, it would not have allowed integration with a whole set of back-end software that was already developed, and required that any commercial product developed with Artik would also have to be sold with Tembo, potentially increasing the cost. A good hacker ethic was needed to plow through some of the issues. In addition, more than once I reached out to the amazingly helpful Artik team and, in the end, it all worked out. Hats off to Samsung for making such a capable system and having such a helpful team! Ease of use and keeping the price down on a final commercial unit were very important and using off-the-shell telephone connectors, telephone cable, and sensors was critical to achieving this goal. While wireless sensors could have been used, they would cost many multiples more per unit, and seriously increase the complexity of installation. Using plain old telephone technology makes it so anyone can use it, and the price is near the theoretical bottom. Finally, by using Additive Manufacturing in the production of the cases and housings, price is kept even lower by eliminating the need for expensive injection molding and the high cost of minimum setup fees and runs on injection molded parts. Finally, my system does everything that Tembo does, without the expense of Tembo. 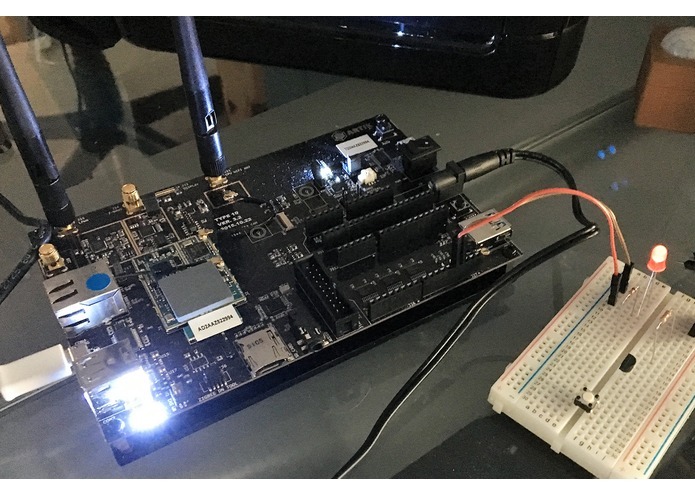 Samsung has released a slew of new technologies with their Artik platform and they use Linux heavily as the host OS on the Artik board. I had never really used modern Linux, not having used Unix since the SCO days. I had to get up to speed with Linux networking and even had to break out the old vi manual! Winning the M.A.D. IoT Challenge would give the W3S the credibility needed to get introduced to the right government officials in California to begin trials and, eventually, wide scale deployment as soon as possible. The product is commercially ready now and can be customized to specific installations very quickly. Concept, electronics, real-time software, 3D CAD, 3D Printing, server-side Web-based dashboard and enterprise quality SQL database.